Alhambra (German: Der Palast von Alhambra, literally "The Palace of the Alhambra") is a 2003 tile-based German-style board game designed by Dirk Henn. It was originally published in Germany by Queen Games in a language-interdependent version; an English-specific version was released in North America by the now-defunct Überplay. The game is an Arabian-themed update, set during the construction of the Alhambra palace in 14th century Granada, of the 1998 stock trading board game Stimmt So!, which in turn was an update of the 1992 mafia influence board game Al Capone; the original version was subsequently released as Alhambra: The Card Game. Alhambra won the Spiel des Jahres award, the Schweizer Spielepreis for Family Games, the As d'Or and the Essen Feather for the year of its release and placed second in the Deutscher Spiele Preis. Its success has led to the release of numerous expansion packs and spin-off games, and is becoming Queen Games' flagship franchise. The game consists of a deck of "currency cards" of various values in four currencies (suits) and a bag of "building tiles" of various prices, as well as a number of boards (a currency market, a building market, a reserve board for each player and a scoring track). Six of the building tiles are "Alhambra tiles;" these are taken out of the bag and one is given to each player. Each player is then dealt currency cards until the total value of cards in their hand is greater than or equal to twenty. The currency cards are shuffled into five piles, and the two special scoring cards are inserted into the second and fourth piles. The five piles are then placed in order to form the currency deck. Four currency cards are drawn and placed on the currency market, and four building tiles are drawn and placed on the four spaces of the building market. The set of tiles connected to a player's Alhambra tile is called their "Alhambra." Draw currency cards - either one card of any value or multiple cards totalling five or less. Buy building tiles - by discarding currency cards totalling the value of the tile or greater. Each space on the building market has a currency type next to it; all cards discarded must be of that suit. If the value of cards discarded exactly equals the price of the tile, the player gets another action. Tiles must be placed in the reserve board or attached to their Alhambra (players do not have to place tiles in the order they were purchased however). Move a building tile - either from their reserve board to their Alhambra, from their Alhambra to their reserve board, or swap two tiles (one from their reserve and one currently in their Alhambra). Currency cards and Building tiles are then added to any spaces on the Currency market or the Building market. Some tiles have walls along one or more edges. When players add tiles to their Alhambra, it must be possible to trace a path from the new tile to the fountain that was their start tile, remaining within tiles and without crossing any walls. It is also not permitted to create "holes" such that all four sides of a gap are closed in. When the scoring cards are drawn from the Currency deck, or when the there are fewer than four buildings remaining to be sold, scoring occurs. Each player scores one point for each wall segment in their longest wall. The player with the most of a given building card type scores points according to that type; in case of a tie, points are split between players. More common building types are worth more points, and building types are worth more points in later scoring rounds. In the final scoring round, the player with the most of a given currency type takes the tile of that currency type and may add it to their Alhambra before scoring. Winning the Vizier's Favor introduces a vizier for each player. The vizier may be used to play out of turn. A player's vizier may be brought back into play by skipping their turn. The Bureau de Change introduces special cards to the deck. These special cards allow players to mix currencies when buying tiles. The Bonus Cards introduces cards which are given out to each player at the start of the game. The cards grant its player a bonus if they possess the tile on the card in their Alhambra. The Worker's Hut introduces worker hut tiles. Worker hut tiles are free for the taking, but ends a player's turn. They score only if other tiles of the same colour are adjacent. The City Gates introduces six city gates and six city gate cards to the deck. A player may during their turn pick up a city gate card, which allows them to, at a later point in time, place a city gate. City gates, which are placed on walls, allow buildings to be separated by walls while still being accessible - as if the wall did not exist. The Diamonds introduces a new currency into the game: diamonds. Diamonds may be used in place of any currency when buying tiles but may not be combined with other currencies when doing so. The Camps introduces eight camp tiles, which are bought as with other buildings. However, camps must be separated from the city by a wall, and may not be adjacent to each other if there is a wall in the way. Camps score points for every building tile in the direction of its walls. The Characters adds ten character cards representing persons. These character cards, once uncovered, are immediately auctioned off to the highest bidder and grant the winning player different abilities, some of which are used once, some of which may be used repeatedly. The City Walls adds eight city wall cards to the deck, which allows the player to add wall segments to tiles without them. Walls added in this manner, however, cannot be removed for the remainder of the game, and may not have city gates built on them. The Thieves adds 12 thief cards, which are given to the players at the start of the game. A player may play a thief card between turns (except before their own turn) and take a currency card matching the type of thief card played. The Change adds coins to the game. Whenever a player overpays for a building, half of the difference is refunded in coins of random currencies. Coins are worth one unit of their particular currency, and may be used with cards to buy buildings. The Street Trader adds traders and circular trader tiles. Trader tiles are given to each player at the start of the game, and are placed adjacent to any tile. If a player builds in the location of the trader tile, they may place a trader of a matching colour from the trader tile to the building (or exchange a trader for one of another color), and the trader tile is moved. There are three traders on the trader tile at any given time. Points are awarded based on the number of traders in building tiles. The Treasure Chamber adds treasure chests to the game. There are three treasure chambers, each containing four chests. At any point in the game players may buy the chests in one chamber, and place the chests on buildings in their Alhambra matching the colour of the chests. Players gain additional points for the number of chests in their Alhambra. The Master Builders adds Master Builder cards, which are given to players at the start of the game. Master Builder cards may be used either as currency or may be discarded to move a building tile. The Invaders adds invasion cards and scout cards to the game. Whenever scoring occurs, an invasion card is drawn. Players lose points for each building tile on the edge of their Alhambra without a wall in the direction specified by the invasion card. Scout cards may be used to look into the next invasion card, and may be taken whenever a building of the same type is bought. The Bazaars adds bazaar tiles to the game. Bazaars, when drawn, are placed next to the building market, and may be bought (with exact change only) for the same price as the building of the corresponding currency type being sold. Bazaars score only in the final round of play, and score a point for each adjacent or diagonal building matching the colours on the bazaar. The Caravanserai adds special Caravanserai cards to the game. Each player may buy up to two Caravanserai (which cost less if their Alhambra is more diverse). Caravanserai cards provide income to the player, and appreciates in value the longer they are unused. The Art of the Moorish adds culture counters to the game. Culture counters are obtained when a player builds at least two buildings of the same cost. During a player's turn, a player may choose to develop culture, in addition to the existing actions. Victory points are awarded during normal scoring based on the number of times that culture was developed as well as the number of buildings of the same cost that has been built. The new Score Cards changes the relative score values of the six basic types of buildings in each of the three scoring phases. The Power of Sultan adds Sultan cards to the game. Sultan cards may be bought as with any other building. Once bought, a special die is rolled, and the building type corresponding to the rolled value (or the building type opposite to this value) is marked. When a new building is drawn, players who have marked the particular type of building may use the Sultan card to immediately claim the tile and use it. The Falconers: players can now purchase and place falcons on intersections of four buildings in their Alhambra. The magnificent birds of prey will certainly delight their owners - with victory points. The Portals: portals offer players new ways to build their walls and gain even more victory points for them, especially if they are part of their longest contiguous wall. The Building Sites: allows players to purchase and place buildings for half price. Its walls are completed instantly but the building itself will only score once it's finished. The Exchange Certificates: if a player overpays for a purchase he gains a voucher for the amount he overpaid in a currency of his choice. The promo expansion/module "The Magic Buildings" adds 6 magic building tiles to the game. When drawn, these tiles can be placed to score extra points depending on their surrounding tiles. The Gardens of the Alhambra (Die Gärten der Alhambra, 2004) is an updated version of the tile-laying board game Carat, originally released in a more abstract form by db Spiele in 1993. 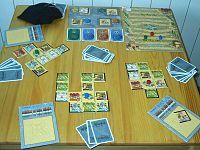 Troisdorf (2005) is a limited, re-themed edition of Alhambra, with identical rules, set in and only sold in Troisdorf, the town in which Queen Games is based. Alhambra: The Dice Game (Alhambra: Das Würfelspiel, 2006) is a die-rolling game, broadly similar in play to Yahtzee. A video game version was being developed by Vivendi Games for the Xbox 360 console system via Xbox Live Arcade, but has been indefinitely postponed.